The front of the store today. In 2009 Gilbert Williams and partner, Gary Zimmer, purchased the cleaning mill from Lone Rock Milling in Lone Rock, Wisconsin, a town of 888 next to the Wisconsin River. Initially they were only cleaning local rye as a cover crop seed. As word got out that the Clipper 29D seed cleaner was running again, more grains were trucked in to be cleaned. In the first season of rye cleaning, the first employee was a young farmer and local food lover by the name of Jeremy Lynch. One day he brought home samples of the wheat and rye seeds and, using his coffee grinder, ground them, blending them together to create what is now the well-known Lonesome Stone Pancake Mix. From young ingenuity was born a lynchpin of Lonesome Stone Milling, the first of our 4 pancake mixes. At the time, though, they had to mill their grains off site. However, when the building next to the feed mill became available they were able to expand the business and do the milling on site with their newly purchased stone mill. It was a Meadows Mills 30” meal master. Gilbert had a history of work in the food industry, including quality control at Cedar Grove Cheese in Plain and Richland Hills Sliced Apples in Richland Center WI. Working with food, and being close to the land, are both fulfilling, and a calling for him. He holds a bachelor's degree in chemistry, and a master's degree in agronomy, giving him a deep understanding of how to grow the best grains in our area. Gilbert knew from the start that the farmers were the key to making this venture work. He has built relationships with each of the farmers who bring their grains to the mill, believing that properly supporting them is the only way to run this business with integrity. As they meet for their annual Farmer's Breakfast, that respect is palpable. 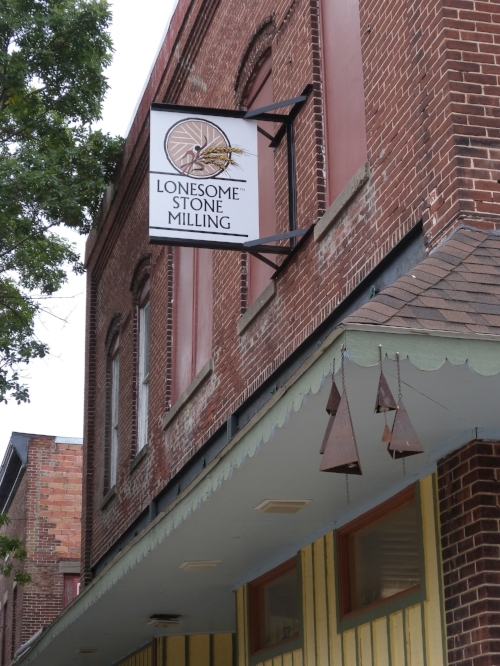 In the ten years since its inception, Lonesome Stone has gone from a small town idea to an interconnected wheel of farmers, millers, restaurateurs, bakers, and individual consumers who all depend on one another. The grains lovingly grown on the ridges of the Driftless Region of Southwest Wisconsin are now being made into delicious and nutritious breads in the River Valley where they were grown, but also in Madison, Milwaukee, and Chicago. We hope that you will discover the deep flavor that comes from our stone-ground flour, as well as the deep satisfaction that comes from being a part of this community.